Volkswagen Eos to go off sale | What Car? The Volkswagen Eos will not be replaced when the current model comes to the end of its life cycle, according to the company's head of design, Klaus Bischoff. 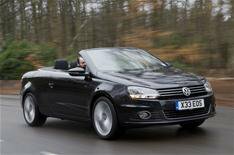 With the launch of the Beetle Cabriolet, Volkswagen will have three four-seater convertibles in its range, so the Eos will not continue beyond the current model. However, he added that the Volkswagen Bluesport concept car that was shown at the 2009 Detroit motor show is unlikely to make it to production as a third convertible. 'The two-seater mid-engined sports car is still a boy's dream. 'The problem is that you need to promote yourself to more than one generation and it is not feasible financially and you won't get anyone to implement such a project when the markets are falling so dramatically in Europe,' he said.